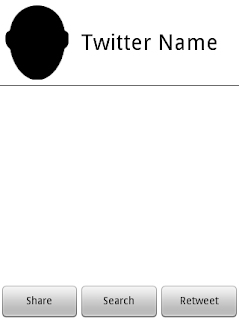 Android layouts can be very intimidating at the first look. Instead of a grid where you can drag components to precise absolute positions, you are greeted with xml code and a WYSIWYG (What you see is what you get) editor that doesn't seem to behave the way you want it to. It's enough to drive you insane and, for some, enough to put you off on Android development entirely. But don't despair! Follow these tips and you will be making layouts in a flash. 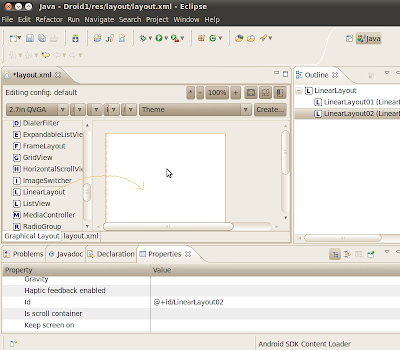 You may even learn to love Android XML Layouts. This is a crucial step. It can help to organize your thoughts and lead to less headaches and frustrations when you actually start to design for real. One strategy is to used a notecard for the layout sketch. Notecards provide a rough approximation of the size of an Android smartphone. If you want to be more organized, I recommend using a notebook or a sketchbook so you can keep multiple layouts for a single app together. 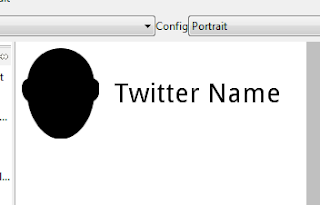 For this tutorial we are going to pretend that we are creating a layout for part of a simple twitter application. The completed sketch is shown below. Now that you have a sketch of what you want your layout to look like, start picturing the pieces of the drawing as views. An Android layout is made up of views. Views are components like Buttons, Images, and Text Inputs. These views can organized in a number of sub layouts. I recommend sticking using LinearLayouts to organize your views. LinearLayouts are simple, easy to modify, and can handle mostly anything. A lot of times it seems easy to think in terms of tables, but Table Layouts are not as flexible, and will usually end up causing problems and frustration as you try to modify them. TableLayouts force equal column width, and make it difficult to span columns. 3. 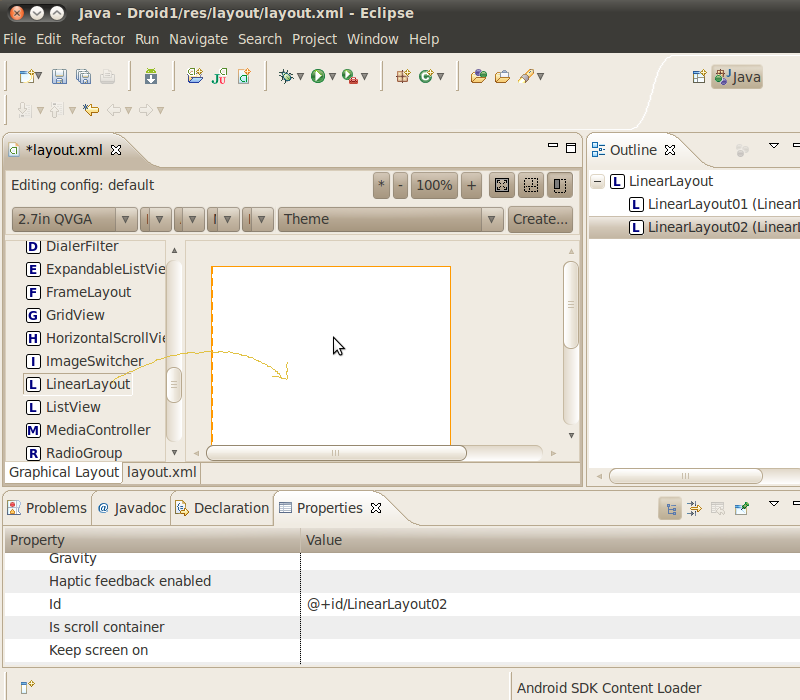 Start a New Layout in Eclipse. To start, create a simple "Hello World" type application. See this tutorial for more information. I chose to create an Android 1.5 project, but you can choose a different version if you like. In the project explorer right click on the layout folder and select "New Android XML File" Type in layout.xml as the name, and make sure the type of resource selected is layout. The WYSIWYG in Eclipse can be difficult at times but it makes designing layouts easier by giving you the outline view on the right, and the property list editor at the bottom. Click the element named LinearLayout in the outline view. Now you can easily change the properties associated with the outline view from the properties view. The properties view is generally located at the bottom of the screen, next to the console output. If you can't see it go to Window->Show View->Other...->General->Properties. Make sure the following properties are set for the outline view. Now set the background property to #ffffff. The background should turn white. You can enter any valid hexadecimal color code to set the background. Now that we have the base layout set, we want to add another LinearLayout to hold the views for the first row. Click the plus button on the outline view to add another LinearLayout. Note: At the time of the publishing of this article the current version of the Android Developer Tools does not include the plus, up arrow, and down arrow buttons. It is currently unclear whether this was intentional or a bug. You can still add components by dragging them from the list on the left, onto the preview display on the right. ID's should be unique within an xml layout file, but they do not have to be unique among all the xml layout files. When you add an element, the sdk will automatically generate a valid ID for the element, but it can be helpful to change the id to a more recognizable name. Now add the views to the first row. Click the plus button to add an ImageView. Click the plus button again to add a TextView. Use the up and down arrows to adjust the order of the views and make sure they have the proper parent element. The outline view should now look like this. 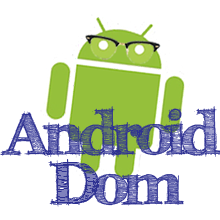 Depending on what target version (Android 1.5, 1.6, 2.0, etc...) of the Android OS you have selected, you will also notice that they place three different folders as the drawable directory: drawable-hdpi, drawable-ldpi, and drawable-mpdi. This stand for high, medium and low density-independent pixel. And were designed to further customize the applications depending on the type of phone (some support better graphics). To learn more please visit: http://developer.android.com/guide/practices/screens_support.html. For now we'll be storing our images under the drawable-hpdi folder. Even though the picture is in a specific folder (hdpi) set the source to @drawable/headonly and Android will figure out where to look for the image. Now set a few of the properties for the views you just added. The layout should look like this now. If you are having problems placing the components make sure the parent layers have the right settings. One possible problem is having the parent layer set up to get the height of the parent instead of wrapping, which made the text appear in the middle of the screen. DIP stands for density independent pixels. Since different devices can have different dpi's, specifying measurements in DIP instead of pixels can help ensure a more consistent look and feel among different devices. ListViews are one of the most versatile Android components. They let you combine may different items that have a similar layout into a object that has built in scroll and flick capabilities. We will add the ListView to the layout in this tutorial. Populating the ListView with actual data is handled programmatically and beyond the scope of this tutorial. 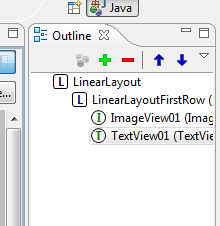 Select LinearLayout from the outline window and then drag and drop the ListView. Now LinearLayout is the parent of ListView. If the arrows on the outline view are visible (see earlier note) you can use them to adjust the hierarchy of the views so that the parent of the ListView01 is LinearLayout. 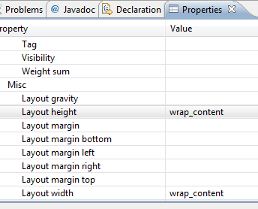 Setting the layout weight as a value of 1 tells the list view to take up all the remaining available space. Select the top LinearLayout and drag and drop another linear layout. By default it will go to the end of the list. Set the following properties. Add three buttons to ButtonLayout. Set the following property for all the buttons. Set the text for the three buttons to be Share, Search, and Retweet. By setting the weights and the widths the same, the three buttons should equally share the width of the available screen. After setting up the properties of the linear layout if you try to drag and drop the buttons it won't work, they won't be added as the child of the last linear layout. So here is Silvia's trick: for the ButtonLayout choose the layout height to be the same as the parent. Now if you select it and drag and drop the buttons, these will be added in the right hierarchy. It is important that as soon as you finished adding the buttons you return the button layout to wrap layout height. The finished layout should look like this. The complete xml for the layout is pasted below. When you are using Eclipse to view the xml, pressing Ctrl+Shift+f will auto format the xml. to make it look nicer.